It has come to our attention that a Chinese company called JaBo-HiTek is selling a pool alarm which strongly resembles the Poolguard PGRM-2 In ground Pool Alarm in appearance. The product is sold under the following names: JaBo-HiTek, China Pool Alarm, JB2005, JaBo USA, and Pool Protector. It is commonly sold through personal protection websites but may be sold under other means as well such as Ebay. The product is a close replica of Poolguard which we believe results in a violation of the trade dress laws of the United States. In our opinion, the workmanship of the JaBo alarm is no where near the quality of Poolguard and, as of August 1, 2007, we have no indication that the JaBo alarm has been third-party verified to meet the ASTM F 2208 Safety Standard for Pool Alarms. We have already received reports of false claims made by JaBo-HiTek about its alarm meeting European standards. We are currently considering taking legal action against this company. 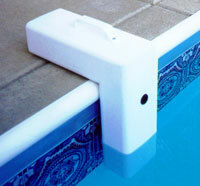 Be aware that you should only buy our Poolguard from our authorized vendors listed on this website. We have seen the JaBo alarm sold under our trademark name by unauthorized vendors and we do not want our customers purchasing this product thinking that it is manufactured or warranted by our company. The Chinese are copying just about everything in the pool industry from other types of alarms to chlorinators to pool toys, please do your research. These copied products are very low quality and hurt American business and our economy. 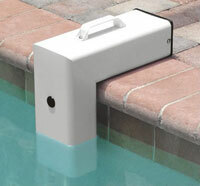 The Poolguard Safety Buoy model PGRM-SB is the only floating above ground pool alarm that meets the ASTM Safety Specification Standard F2208. There are other floating alarms in the marketplace that claim to meet ASTM Standard F2208 which is misleading and false. To be sure an alarm meets the ASTM Standard look for the NSF marking. This means the alarm as been tested by an independent lab to the ASTM Standard.